Normally I do not fish for trout during the spring through fall months. Those months are devoted to the salt. The last few years I have been enjoying tenkara, and occasionally thoughts of doing a quick summer trip creep in. Last weekend my buddy Matt and I decided to skip the salt and fish the sweet water. The forecast was for rain and thunderheads. We got some decent downpours and a few close bolts came down, but we nor the fish seemed to care. Matt found a pool with fish rising. We could not see what they were eating…very small stuff. Sometimes you gotta zig instead of the zag. After trying different other flies, Matt put on an olive wooly bugger. Immediately was into fish. Picking off brook trout, rainbows and browns. I kept clear of the pool figuring that I surely could pick off fish holding elsewhere. I started with kebari, then switched to a brown wooly bugger. Nada. Dead drift…pulse…skimming…nothing. After about and hour, I announced I was coming down to poach his spot. He kindly gave up his spot to me and he proceeded to continue to hammer the fish at the head of the pool. I tried nearly my whole fly box without any action, when Matt announced he had a good rainbow on what we call the creature. Ah…Creature goes on and I instantly hook a nice fish. Both Matt and I have been fishing 5m rods this year. I have had some nice fish on my gm53 and could instantly tell this was a decent fish. The fish locked into the hardest current of the river, and I could distinctly feel its tail pumps. 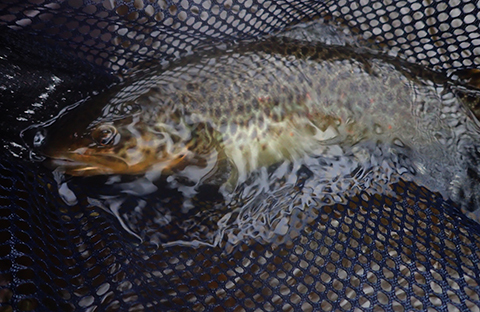 This brown lept a couple times to reveal its size…not bad…it was wide. It took a while to land, the fish did three long laps around me before it seemed close to land. I dropped the fish in the net, and the fly instantly dropped out its mouth. I love barbless hooks!!! 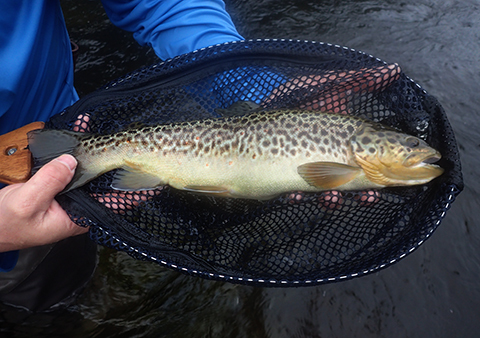 definitely a river leopard…I know they get bigger, but this is the biggest brown that I have landed. I didn’t get an accurate measurement on it, just a couple pics and back in it went. I did not catch another fish, even though fish continued to rise, and Matt continued with some action. They seemed to really respond to that olive wooly bugger. Of course…it got me thinking I should make sure I stock one in my flybox. When I asked him, he noted was swinging, skipping them…and deadsticking/dragging them in current. I tried the to do the same with my kebari and even the creature…not a sniff. That outing…Matt had the power and I was just a spectator who got the scraps. It was a lot of fun. 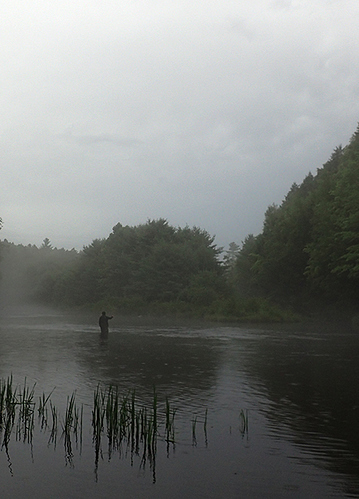 The rain kept the other anglers off the river. Give me rain and a river any day!!! Wow, that’s a fat fish. Sign of a successful hunter. There’s always Tenkara in Saltwater. 海でテンカラ. Something that seems to drive some tenkara purists into madness. Indeed the below video was only uploaded a week ago. Opinion is thus far evenly splint. Two thumbs up and 2 thumbs down. But one comment stating that while it is contrary to the spirit or purpose of tenkara. It would be the bomb if fishing in komase [コマセで寄せて釣る] Unfortunately, I don’t know what that means. Ah, now I fully understand the comment to the video asking, 毛針５つの枝 how about 5 branches of kebari? But the angler, who seems to use the nick-name 大魔王, [Great Devil King I guess], was fishing with only one kebari. I have been fishing the salt…not tenkara…but fixed line clousers on a carp rod. Flyfishing is possible in the salt but poor engineering for the task in most cases. In this case…i was less of a hunter and more of a poacher. I feel we all shine brighter when we fish solo. how about 5 branches of kebari? I only fish one kebari at a time. However, in Velsesia, Italy. Several valleys in the north east of the Provence of Vercelli, northern Italy. The have a type of fly fishing (pesca mosca valsesiana = Valseian fly fishing] that may be as old as Tenkara. It appears to be very similar to Tenkara. Similar method of fishing, and similar looking flies. They typically use 4 flies at once. Maybe catching more than one fish on one cast. Maybe ok if they are small fish. And not two fish like the River Leopard.